The Gibbering Hordes are amphibious creatures that dwell in many of Malifaux's waterways and oceans. Much of their intelligence has been forgotten in favor of sharp animal instinct and a desire to survive. Led by their more aware kin, the Hordes have decided to make the Earth their new home. A Gibbering Hordes army is focused on melee, using their seemingly infinite numbers to conquer their enemies. This is the Gibbering Hordes' Allegiance card. Any time you field the force, your Company (the models you put on the table) will have access to these rules. 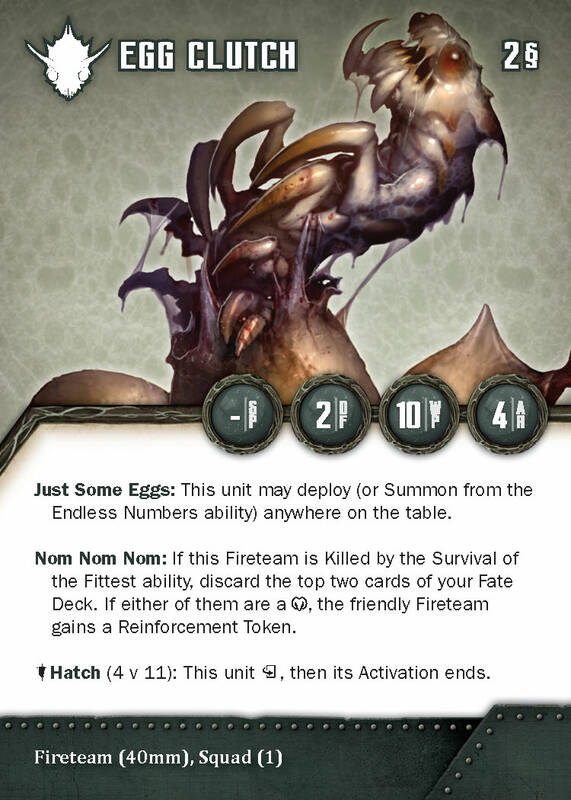 The Endless Numbers ability gives the Hordes the ability to always come back into play by using Tactics Tokens. Their units are not the most survivable, but there are always more of their kin behind to fill in the gaps. Tide Pools help the Hordes control the battlefield by changing the nature of the terrain, trying to push their enemies into unfortunate positions, allowing the Hordes to capitalize on their enemies' weaknesses. The Hordes themselves are able to ignore the penalty from the Difficult trait of the Tide Pools, making sure they are always a positive for your models. The Stormsiren is one of the Gibbering Hordes' Commanders. She brings the average of 25 Scrip to the game, which she can use to hire the units she needs to defeat her foes. She is one of the only Commanders with a Tactics value of 3. This gives her a few more options than other Commanders. She also creates an additional Tide Pool piece at the start of the game, giving Companies that contain her even more battlefield control. Her Grasping Tentacles attack has a good Strength, but if she manages to get you in water that's where it really shines. This is made easier for her with the use of Siren's Call, which lets her move an enemy Fireteam. Since Commanders get a free Morale Action, she can use Siren's Call and still make an attack that turn. When the Stormsiren flips to Glory, she really begins to shine... she turns all Tide Pools into Hazardous Terrain and has the ability to create more as an Action, giving her massive control over enemy movements. What's more, her Siren's call becomes even more potent, allowing her to move entire enemy units and move them further than before. The Frenzy are actually a whole group of creatures, always fighting with each other for dominance. The lead three always lead the charge, and serve as a Gibbering Hordes Commander. 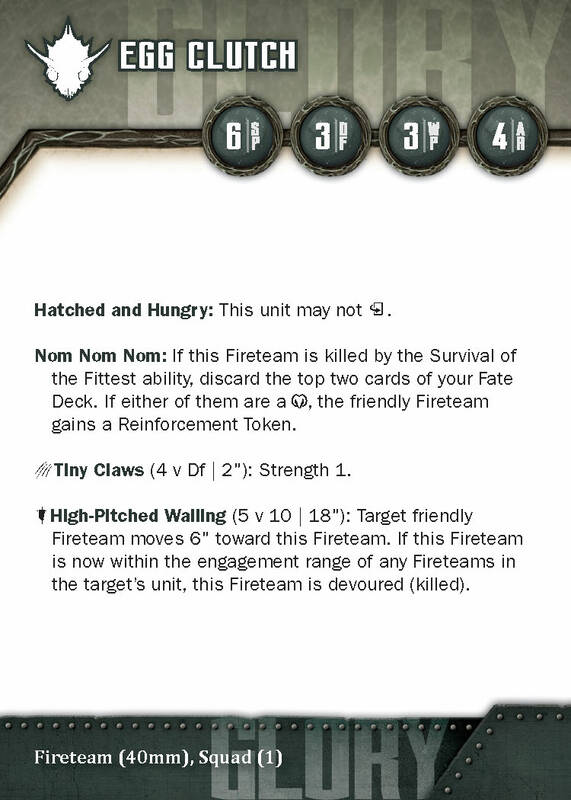 The Frenzy are a Squad Commander. This means that they not only have access to Assets and the Commander rule to reduce damage, but they also can use Reinforcement Tokens to replace their lost members. They are Fireteams of a single model, making them easily able to get where they need to be. This survivability is a boon because they need to be in the action. The Frenzy is capable of inflicting incredible damage in melee, using Tear Apart in conjunction with Blood in the Water to show the power of the Frenzy. On Glory, the Frenzy gets stronger, able to better gain and use Reinforcement Tokens. Suffice it to say, this is a Commander that it's better to shoot than to try to fight in hand to hand. The Striped Skulkers are her go-to unit. 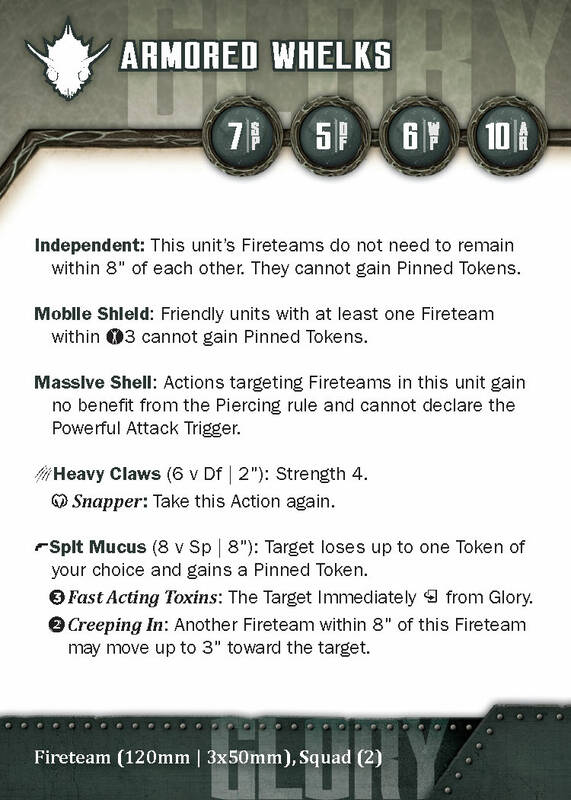 They are able to deploy anywhere on the table (making your opponent extra leery) and get bonuses when touching terrain. With the Gibbering Hordes' default ability to create Tide Pools, the Stormsiren creating more, and a Stratagem that lets them create a Tide Pool, the Striped Skulkers will often benefit from their Adaptive Camouflage. Karkinoi are powerful hitters for the Hordes. Their attacks are decent, but as they start getting Reinforcement Tokens they begin to really show their power. Able to reach a staggering Acting Value (AV) 8 with Strength 4, these Fireteams can rip through any foe. Add in their action to summon an Egg Clutch (whose best purpose is being eaten, to be fair) and the Karkinoi are a force all on their own. The Yarazi are the Gibbering Hordes' fastest unit. With a quick Speed 10 and the Ability to Glide above other Fireteams and some Terrain, they are capable of getting where you need on the battlefield. When Charging, the Yarazi can move a full 20" and follow up with a 2" Diving Pounce (for a total threat of 22") that comes in on a mighty Strength 4 on the Charge. There's also less danger of leaving the Yarazi over-exposed, as they are able to move a full 10" after one of their Fireteams are killed. This lets them run in, and if they start suffering loses, run out.